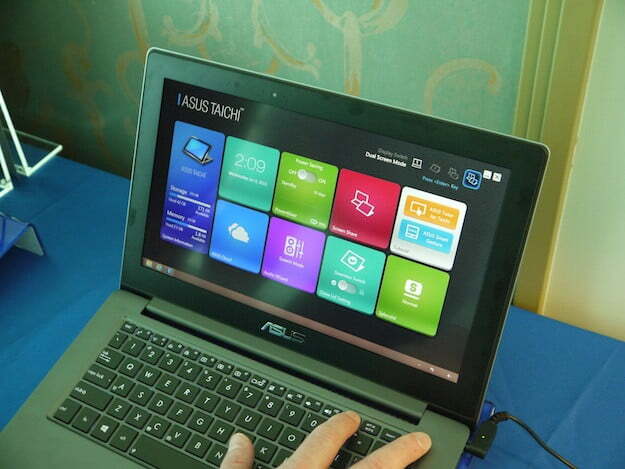 Check out our full review of the Asus Taichi 21 hybrid Ultrabook/tablet. We heard about ASUS’ Taichi back at Computex in June and we’ve patiently waited for the last six months for the unique convertible to be released. The company showed off its final version at CES in both the 11.6-inch (Taichi 21) and 13-inch versions (Taichi 31). The Taichi, which is both an Ultrabook and a tablet, was definitely worth a closer look, so we got some hands-on time with both models. At first glance, the Taichi looks like a normal laptop. You’ve got your full-size QWERTY keyboard (backlit) and your track pad. But it’s more than a standard Ultrabook. When you close the Taichi, it becomes a tablet – no flipping, twisting, or turning required. Different from any other convertible we’ve seen, the Taichi has a two-sided LED-backlit IPS display. Closing the Ultrabook transforms it into a 10-finger multitouch tablet with stylus support. But the rear display isn’t just for tablet-mode. The Taichi actually has four viewing modes: Notebook, tablet, mirror, and dual-screen. To switch between different screen modes, users have to use the built-in app, which has a dedicated button on the top row of the keyboard. You can use the display on the back of the notebook to mirror what you’re seeing in the front, which is convenient for meetings and collaborations. The two screens are actually independent of each other, which means you can have one set of content on one screen, and something entirely different on the other. We thought it was a little strange that the screen facing the user didn’t have touch capability. We found ourselves trying to touch the screen more than once because that’s nearly expected with a Windows 8 operating system. It’s also disappointing that you aren’t able to use the touchscreen with the physical keyboard, since to fully use the touchscreen, you need to close the laptop. The Ultrabook is powered by either Intel Ivy Bridge Core i5 or Core i7 processors. It also includes 4GB of RAM and a 128GB SSD storage. As for ports, it features one mini VGA port, two USB 3.0 ports, a micro HDMI port, and your standard audio jacks. The 11-inch Taichi has up to five hours of battery life. Weighing a little less than three pounds, the Taichi is 3-millimeters thick at its thinnest point. We found both models easy to handle. Though we only had a few minutes of time fondling the Ultrabook, we didn’t notice many fingerprints or smudges on the touchscreen. The Taichi 21 will be available for sale in about two weeks, and the 31 will be available in three. Pricing is still not confirmed. We’re excited to finally get some real time with the Taichi, so stay tuned for a full review.